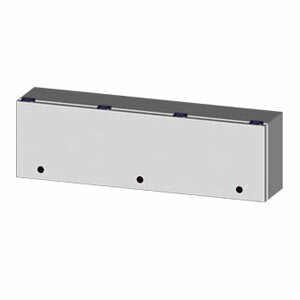 Junction Boxes - Wall Mount NEMA 4 & 4X Electrical Enclosures for Through Wiring and Housing Electrical Components and Instruments - Sizes 9 x 12 to 9 x 36"
The SCE-TJ Series is designed to house electrical controls, instruments and components used in an indoor or outdoor environment. They provide a degree of protection for the equipment inside the enclosure against ingress of solid foreign objects (falling dirt); and provide a degree of protection with respect to the harmful effects on the equipment due to the ingress of water (rain, sleet, snow). Note: Comes complete with mounting feet, sealing washers, and hole plugs.